The official lyric video for "Madness", a brand new song from Massachusetts metallers ALL THAT REMAINS, can be seen below. The tracks will appear on the band's forthcoming eighth studio album, which is due out on April 28. The effort was recorded at West Valley Studios in Woodland Hills, California with producer Howard Benson, who has previously worked with such acts as MOTÖRHEAD, PAPA ROACH, THREE DAYS GRACE, FLYLEAF, P.O.D. and HALESTORM. 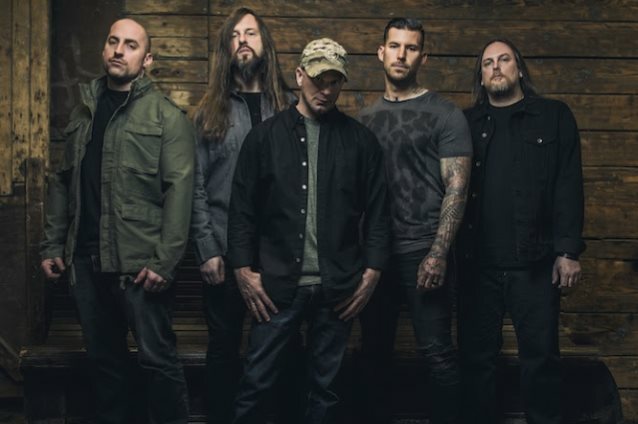 ALL THAT REMAINS singer Phil Labonte told SiriusXM's Jose Mangin that "Madness" was inspired by the way individuals and societies fall into harmful patterns. "People tend to kind of get into kind of ruts in their lives or into patterns, and they keep doing the same thing over and over, even though it doesn't produce the results they're hoping for," he said. "You can see a lot of societal cycles where nations just keep doing the same kind of stuff over, and it doesn't always have great results. But still, it seems like a good idea. So, that's kind of the idea is like human beings, whether you're talking about individuals or large groups, they get into these kinds of cycles of repetitive things that can be really destructive, and so that's kind of what I'm thinking, that's what 'madness' is." Asked by Ryan Daniels of of Rock 105.5, Carolina's Pure Rock radio station, about the "sellout" accusations that have been leveled at ALL THAT REMAINS for the more radio-friendly sound of "Madness", Labonte said: "If you're doing something — making music — and specifically catering to an audience that you have catered to or that has found something to attach to, is it a sellout to try and change and do something different? Or is it a sellout to be, like, 'Okay, this is the safe play where I know I can make my money?' It's, like, I know I that I can cater to this narrow group of people, and if we don't stray, these people will keep buying our records, these people will keep coming to our shows. Is it a sellout to be, like, 'I'm gonna try something different?'"